F1: Top 5 Unusual F1 Podium Ceremonies, bet you never knew! 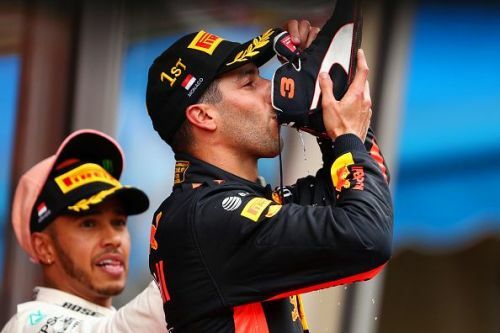 Podium ceremonies in Formula 1 are generally straight-forward. The top three race finishers are allowed onto a raised platform for the national anthems to be played. After that, the drivers along with the winning constructor team’s representative, spray and drink the champagne. A Grand Prix is incomplete without a rostrum celebration. Most of the fans watching a race in person, prefer rushing to gather below the podium and more often than not, race viewers all over the world do not switch off their television screens before the festivities are over. The trend to shower onlookers with champagne was started by Dan Gurney after he won the 1967 24 Hours of Le Mans. It quickly caught on and has now become a given for celebrating on the F1 rostrum. Albeit, the champagne has occasionally been replaced by sparking rosewater, orange juice or even local beer in the case of Gilles Villeneuve emerging victorious during his home race in 1978. It is common practice to have the champagne bottles opened prior to being handed over to the drivers on the podium. It helps the drivers to get straight into celebration mode after the formalities have been done away with. During the 1986 Brazilian Grand Prix, the drivers were given bottles with the cork tightly intact. 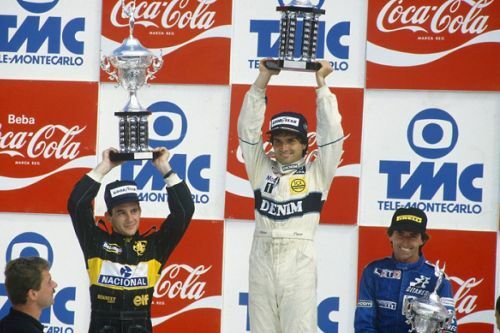 Once the national anthem stopped playing, the trio of Ayrton Senna, Jacques Laffite, and Nelson Piquet, were baffled to find out that they were supposed to work hard before they could enjoy the bubbly. After fiddling with the bottles for a little while, the drivers were finally able to spray the sparkling liquid onto each other and the fans. The small mistake on the part of the organizers brought about a few chuckles but the podium finishers quickly resumed the festivities.